Home > Promotion > What are Fashion Shows Worth to Your Business? What is the first image that springs into your mind when you hear the word 'fashion'? For many, it's the fashion show. The fashion business has many other systems for internal marketing, but nothing captures the attention of the press like models gliding along a catwalk in the latest styles. If you want to be featured in the big fashion magazines, fashion shows are a must. But as a new designer struggling to get your clothing business off the ground, can you really afford them? Exhibiting successfully at a fashion show can be an expensive business. Often there are high appearance fees, plus you may need to pay models and to spend a lot of time getting everything ready (always remember that time is expensive in itself). Furthermore, if you want to make the most of a fashion show appearance, you should always accompany it with a press release. If possible, you should have your own photographer present so that you have catwalk images available to provide to broadcasters, newspapers and magazines. 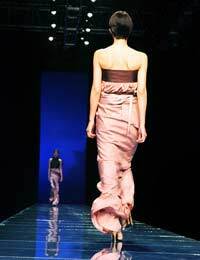 Assessing just how much a particular fashion show benefits your business can be difficult. Factors to consider include sales leads (remember that quality, as well as quantity, is important), the strengthening of your brand identity (try to collect every media article you're mentioned in), and any direct increase in retail sales immediately after you receive media coverage. Although it may not be something which you can afford to do frequently during your first few years of trading, a fashion show is a great way to mark your official launch, to let people know you're out there. However, if you try to run your own, it's unlikely that any important magazines will notice you. It's best to try to get your work into an existing fashion show, some of which have special sections for new designers. Of course, when you're an unknown, you may find this difficult - so now it's time to take advantage of those networks you've been trying to build. Many large cities have fashion shows focused on promoting local designers; your local business support service may be able to help you get a place at such an event. When you launch at a fashion show, it's important to make a big impression. Try to find out who else will be exhibiting and make sure your clothing will stand out. Focus on style and quality. Don't be gimmicky, as the seasoned press will see straight through that. Don't try to shock, as there's practically nothing you could do in that regard which hasn't been done before. You'll often get to pick your own music, so use this to set the right mood. Remember that, as far as the press is concerned, you're selling a whole image, not just a single garment. Accessorise the clothing you show. Make sure your models have the right shoes and the right hair. When you show your work for the first time, it's important to create a buzz. If possible, get your friends along. Encourage them to get into conversations with other attendees about your work. Even if they encounter negative opinions, they can provide you with useful feedback. If your fashion business is focused on niche marketing, fashion shows can still be important, but are much more affordable. Participation fees are usually much lower and you can get away with using amateur models. Shows like this are generally advertised by word of mouth. Often they are announced with too little notice for much attendant publicity to appear in the related press, which usually consists of small publications with slow turnaround times. When you're showing your designs at a niche fashion show, you should target your promotional efforts not at the press but directly at the public. Flyers in social venues connected with your target group can be an effective way to do this. Fashion shows may seem like an expensive and troublesome way to promote your fashion business, but they can generate big rewards. Many women base their fashion choices almost entirely on magazine coverage of the catwalk. The important thing is that, if you're going to exhibit at a fashion show, you do it right, and you make sure the world knows about it.